Lots of people continue to ask me about the free downloadable FVR start-up kit that I created back in 2014. I posted two short novels that my classes had co-written, formatted so that anyone could add to their own class library. The project did not attract the collaboration that I had hoped – who has time to co-write entire novels with their classes?! I temporarily closed the website until I could create an easier collaborative project from which busy teachers could realistically benefit. Today I would like to invite you to imagine again the possibilities of this wonderful, much reduced but much more realistic project. There is a lot of research that supports self-selected pleasure reading as one of the best ways to develop the language skills of intermediate and advanced students. 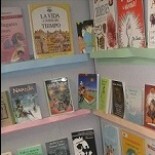 Typically, however, language teachers do not have a budget to build a classroom library. Even if there is a significant reading component to the class, the reading often takes place through a single book that the entire class reads together. That is a completely different dynamic than self-selected pleasure reading. I started this project with the dream of creating a starter classroom library so that language teachers could get a sense of the power of FVR (Free Voluntary Reading). A complete class library can be an expensive proposition. My hope is that this starter kit, freely available, will allow teachers to experiment with FVR without requiring a significant financial investment. These books are not for sale, but neither are they free. We work like a cooperative: submit a booklet that you have written with your class and in return you will receive a copy of every other book in the library. Personally I believe that education should be a cooperative project of the community, not driven by big money. If you share this vision then please consider sharing your work.